$129.99 to $249.99 & FREE Shipping on orders over $59 $35. An excellent, attractive upgrade to your Braumeister! This stainless steel domed hood helps trap heat to get your brew up to boiling faster, and promotes a more vigorous, rolling boil. The open top still allows for DMS to be blown off during the boil and can be connected to an exhaust pipe to carry steam out of your brew space. 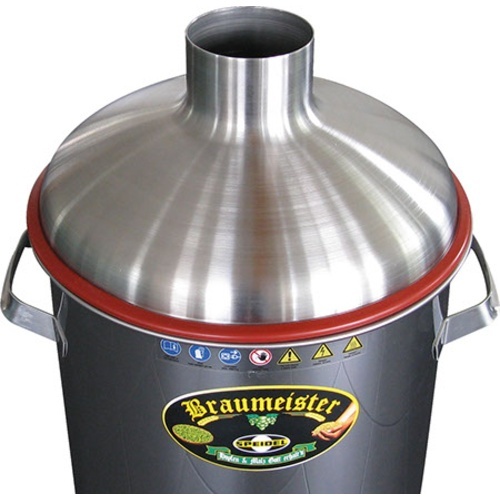 As an extra benefit, the dome can be fitted to the Braumeister upside down and used as a funnel to help when doughing in your malt. Allows for a more vigorous boil and assists with adding malt when doughing in. Is there a condensate gutter or drain? No! There aren't. Unfortunately In my case the wort poured out. I mixed with the spoon and it solved, but I have to keep an eye on it. Anyway I liked it. Hello I would like to know if you have stock of this product for the 20 liters is the 2014 model, and how long it takes to send it to Cutler Bay, FL 33190 ? BEST ANSWER: Hello Antonella - Yes, these are in stock in our California warehouse, shipping to Florida would be approximately 4 business days. I only wish it had handles on the top. It gets very hot post boil.